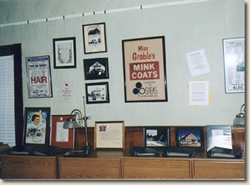 One of the largest archival displays that T-AHS has is that of the Lakes Region / Gilford Playhouse. Summer theater had a long-time running in a large barn in the B-Mae section of Gilford. Many a well-known theater performer who came to Gilford to appear in Summer Stock was interviewed by T-AHS's own Esther B. Peters, as attested to by a poster displayed herein.